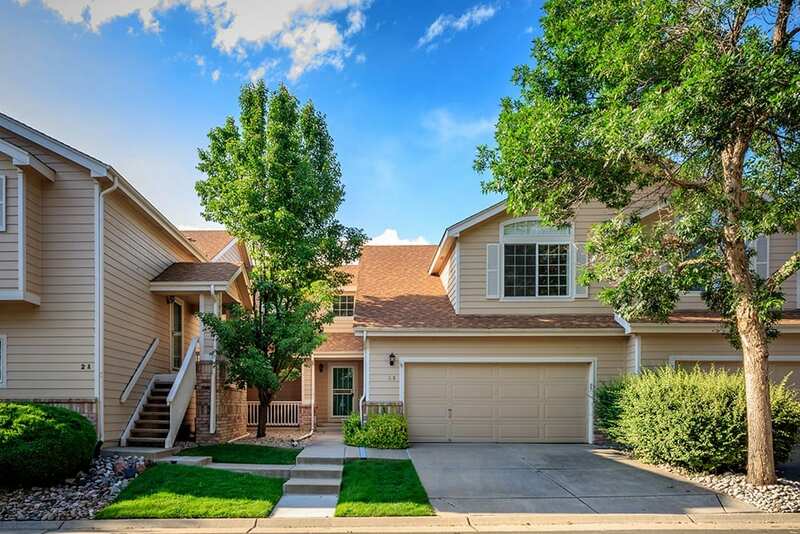 Impeccable townhome in the sought-after community of Grant Ranch. This extraordinary home features quality upgrades including classic crown moulding, plantation shutters, stunning wide-plank wood floors, and contemporary finishes. Open and inviting, the living room showcases soaring, two-story ceilings, a gas fireplace, and an entertainment niche. Perfect for entertaining, the adjoining dining room maintains seamless flow and plenty of space. Just beyond, slab granite countertops, stainless steel appliances, and modern white cabinetry with undermount lighting appoint the updated kitchen. Upstairs, retreat to the vaulted master complete with a spa-like five-piece bath and a large walk-in closet with built-in shelving. Also on the upper level is the secondary bedroom, also with vaulted ceilings, a full hall bathroom, and convenient laundry area. Enjoy beautiful Colorado mornings on the private patio. Attached two-car garage provides room for all the toys and extra storage! This desirable community backs to Raccoon Creek Golf course and offers remarkable amenities including a pool, clubhouse, and lake access with marina! Close to Belleview Shores shopping center and Southwest Plaza with a multitude of options for dining and shopping.